In objection to this abhorrent post regarding the movie, "Elf," I submit this entry. I am not a Will Ferrell fan. In fact, I can't think of a single movie of his that I enjoy. Except for "Elf." Something about his child-like mugging for the camera actually works in this scenario. Does "Elf" in any way address the true meaning of Christmas? What is the true meaning of Christmas? A Google search of this will lead you to quite the array of Christian web sites. So, I will tell you what I believe to be the true meaning of Christmas: Christ's birth and a world-wide celebration of Christ-like love. Does "Elf" touch upon this? Yes. Although hidden in fields of candy canes and gum drops, Christ-like love representation is obviously there. All of the characters are skeptical of this "outcast" at first, but all of them grow to love him unconditionally, in spite of all of his flaws, whether in the North Pole as a baby or New York as an adult. This is a story of a father and son from different worlds who learn to connect. I'm not asserting this movie has a Christ-figure, simply the representation of love. How could I say, "No. 'Elf' has no spirit of Christmas?" There is more than enough about the holiday season that makes no sense in celebrating the birth of Christ. If one is going to get that stingy with a definition, then we wouldn't be able to qualify most of the movies we love this time of year. "Miracle on 34th Street," "It's a Wonderful Life," "White Christmas." We would lose the songs that tickle our ears, "Let it Snow," again "White Christmas," "I'll be Home For Christmas, and more. How many of them talk about the birth of Christ? None. Yet all of them make us feel the glow of the holiday season. We need to be loose with our definitions of "Christmas Classics." Does the movie make me feel warm and fuzzy and want to celebrate the holidays in a loving way? Check! Now, whether or not a person enjoys the movie is entirely objective and understandable. But I don't think you can argue that "Elf" is not a new Christmas classic to many, many people out there. Perhaps it is using all of the secular symbols of Christmas to fill it out, but it makes many smile (Smiling's my favorite!) and could warm the cockles of even old Scrooge's heart. Christmas time, for non-Christians, has mostly metamorphosed into what translates as a season of Christ-like love instead of a celebration of Christ's birth. Some people abhor this. I find it fascinating and wonderful - that the whole world can gather together in a celebration of love. For those of us who worship Christ, we can celebrate His birth, as HE is the reason for the season...while continuing to love and honor others and their beliefs. Wouldn't Christ want us to all care for and respect each other in a generous and selfless way? The movie constantly refers to "Christmas Cheer." What is Christmas cheer anyway? I think that is part of what makes this movie great. I hear the ambiguous term and feel whatever Christmas cheer is to me. I'm sure my definition is different from the next person. But we can all relate to this vague concept without it being spelled out for us, whatever our beliefs are. This truly is the most wonderful time of the year. And I think "Elf" makes this time of year a little more wonderful for me. This is why I didn't try to argue with him-I knew you would be able to phrase it MUCH more eloquently than I ever could. 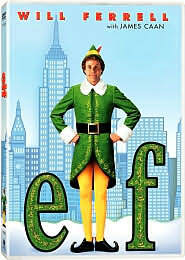 It's a classic just because it's so elfing entertaining. Home Alone is a Christmas classic too, and it's not because of the scenes at the church. Regardless of the reason, thanks for sticking up for my favorite Christmas movie. When it comes to Elf, I'm in love, I'm in love, and I don't care who knows it. Wow. You got yourself really worked up about this, didn't you? I personally have a hard time applying the term classic to any movie that came out in the last decade. The test of time is what I think determines whether it's a classic or not. 1940s Radio Hour Opening Night!